The small bungalow park "La Perla di Sicilia" with its ten newly decorated bungalows is situated next to a sandy beach, on one of the most beautiful coastlines in Sicily. The center of town, shopping, restaurants, bar and "gelaterias" are only a few minutes´ walk away. The bungalows (app. 60 sq. meters) are completely furnished and include 2 bedrooms, a dining-area with kitchen, shower, WC with bidet, and air conditioner. In all our bungalow are available a small TV with many international speaking programs and a wifi-connection (on charge). There is also a patio and a covered parking space free of charge. 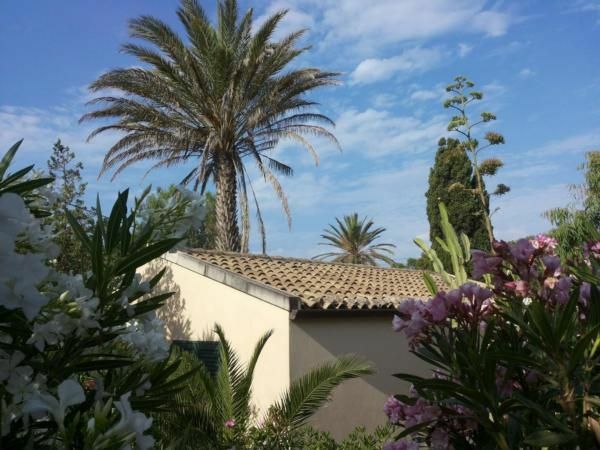 The bungalows are surrounded by beautiful oleander-, lemon-, orange- and fig trees, as well as small and big palm trees. Warm spring like temperatures during the low seasons invite you to spend the winter in Sicily. Linen and towels can be had for 1 Euro per day and person. We also rent bicycles, lounges and umbrellas (on charge). The air conditioner on request can be use for 5 euros each day. To get to all the interesting cities and archaeological sites in the area we advise you to rent a car. If you wish we will get a rental for you. - Internet: per object and day Costs amounting to 1 EUR (optional). - Towels: per person and day for rent at a price of 1 EUR (optional). - Bed linen: per person and day for rent at a price of 1 EUR (optional). In July and August, however, the Italians´vacation time, the quiet resort town really comes to life. There are sports activities on the beach, market stalls on the boardwalk, live bands and folklore in the "Piazetta", as well as numerous bars and discotheques. From the city square a wonderful seafront begins. Here, every sunday in the off-season and every day in the peak season marketeers are placed for selling jewellery, clothes, bags, and toys. In July and August, a market with a numerous number of stands for fruit, cheese, and clothes takes place at the end of the seafront where a big public place directly to the sea is located. Restaurants, bars, ice cream parlours, supermarkets, and much more can be found either in locality or directly in the seaside. Fresh seafood and shopping malls can be reached in a few minutes by car from Marina di Modica. Air condition (per property and day, included in price 5 EUR). Bed linen (per person and day, to be done by tenant 1 EUR). Cot (per property and day, included in price 0 EUR). Cot for adults (per property and day, included in price 0 EUR). Towels (per person and day, to be done by tenant 1 EUR).